Dominique Reshard Rodgers-Cromartie (born April 7, 1986) is an American football cornerback for the New York Giants of the National Football League (NFL). He played college football for Tennessee State University. He was drafted by the Arizona Cardinals with the 16th overall pick in the 2008 NFL Draft. Rodgers-Cromartie has also played for the Philadelphia Eagles and Denver Broncos. Rodgers-Cromartie is of Haitian descent born with a non-functioning kidney that was removed when he was 5 years old. However, this early setback at a young age did not stop Rodgers-Cromartie from playing football as he attended Lakewood Ranch High School where he was an All-Area, All-Class 5A and All-District 11 defensive back and wide receiver. During his sophomore year he attended Lake Highland Preparatory School in Orlando, Florida. He was named the most underrated prospect in the state of Florida by the High School Recruiting Report and Lakewood Ranch became the fourth high school he attended and the first where he received playing time. While at Lakewood Ranch, he also competed as a jumper and sprinter on the school’s track team. He is also member of Phi Beta Sigma fraternity. While attending Tennessee State University, he played for the Tennessee State Tigers football team for 2004 to 2007. He showed exceptional shutdown ability and displayed the natural hands needed to excel as an interceptor. He also excelled as a kickoff returner and saw action as a receiver during his senior campaign. In 39 starts for the Tigers, opposing quarterbacks completed just 55 of 161 passes (34.16%) thrown in Rodgers-Cromartie's immediate area. He intercepted 11 of those throws, deflected 25 and held the opposition to a minuscule 3.54 yards per pass attempt, the best of any collegiate defensive back over the last three seasons. In addition to football, Rodgers-Cromartie was also a standout performer for the Tennessee State University track team. Despite juggling football spring drills with the indoor and outdoor track seasons in 2007, he qualified for the NCAA Mid-East Regionals after he captured the Ohio Valley Conference long jump title, with a mark of 7.71 meters. In only his second outdoor event, he was named OVC Male Athlete of the Week after finishing third at the Penn Relays with a conference-best long jump of 7.56 meters. During the OVC Indoor Track Championships, Rodgers-Cromartie was named the top male athlete with a sensational performance. He won the 60-meter dash with a time of 6.89 seconds, long jump with a mark of 7.71 meters and high jump with a mark of 2.07 meters and finished second in the triple jump with a mark of 14.83 meters. What made those finishes even more impressive was the fact that he performed most of the indoor season while nursing an ankle sprain. He also competed in the 100 meters, posting a career-best time of 10.75 seconds while he was at Lakewood Ranch High School. Early on, Rodgers-Cromartie's draft stock was considerably low, as many questioned the level of competition he faced during his college years and because of his lack of technique. However, Rodgers-Cromartie impressed scouts during Senior Bowl week, performing very well during the arranged practices, and was named Defensive MVP for the game. Also the quickness he displayed with a 4.29 sec 40-yard dash at the NFL combine led to comparisons to Fabian Washington. Rodgers-Cromartie was drafted by the Arizona Cardinals in the first round (16th overall) of the 2008 NFL Draft. On July 25, he signed a 5-year, $15.1 million contract with the team that included $9 million guaranteed. Rodgers-Cromartie was named the starting nickelback for the 2008 season, behind starters Roderick Hood and Eric Green. In Week 11 vs. the Seattle Seahawks, Rodgers-Cromartie recorded 2 interceptions off Matt Hasselbeck, the second interception securing a Cardinals 26-20 victory. In Week 14 vs. the St. Louis Rams, Rodgers-Cromartie returned a late fourth quarter interception 99 yards for a touchdown, ensuring a Cardinals victory and subsequent Division Championship title. In the 2008 Wild Card Playoff Game between the Arizona Cardinals and Atlanta Falcons, Rodgers-Cromartie intercepted a pass from Matt Ryan (Arizona Cardinals Vs. Carolina Panthers), Rodgers-Cromartie intercepted a pass from Jake Delhomme in the red zone during the second quarter. Rodgers-Cromartie would help the Cardinals reach the Super Bowl for the first time in Franchise History after they defeated the Philadelphia Eagles 32-25 in the NFC Championship game. In Super Bowl XLIII, Rodgers-Cromartie had 5 tackles, but the Cardinals lost 27-23 to the Pittsburgh Steelers. Rodgers-Cromartie recorded 50 tackles and six interceptions in the 2009 NFL regular season and was selected as a reserve to the 2010 Pro Bowl, however didn't participate due to an injury sustained in the divisional round playoff loss to the New Orleans Saints. On July 28, 2011, Rodgers-Cromartie was traded, along with a second round pick, to the Philadelphia Eagles for quarterback Kevin Kolb. He registered zero interceptions in his first season with the Eagles, playing mostly the nickel position, a position he has not been accustomed to playing early in his career. His play stepped up considerably in the last 4 games of the year. On August 17, 2012, Rodgers-Cromartie was fined $21,000 for hitting Pittsburgh Steelers quarterback Byron Leftwich in the head and neck during the preseason. Rodgers-Cromartie with the Denver Broncos in 2013. On March 13, 2013, Rodgers-Cromartie signed a one-year, $5 million contract with the Denver Broncos. In his second game as a Bronco, Rodgers-Cromartie intercepted Eli Manning in the closing seconds of the first half, in a win against the New York Giants. In week 8, Rodgers-Cromartie intercepted Kirk Cousins, and took it 75 yards for a touchdown in a 45-21 win against the Washington Redskins. His first two interceptions were against NFC East teams. His third interception came against Matt Schaub and the Houston Texans in week 16, in a 37-13 win. Rodgers-Cromartie would help the Broncos reach Super Bowl XLVIII after they defeated the New England Patriots 26-16 in the AFC Championship game. In the Super Bowl, Rodgers-Cromartie had 1 tackle, but the Broncos lost 43-8 to the Seattle Seahawks. Rodgers-Cromartie finished the his only season with the Broncos with 31 tackles and three interceptions. On March 17, 2014, Rodgers-Cromartie signed a five-year deal with the New York Giants. In the 2014 season Rodgers-Cromartie had 38 total tackles and two interceptions while also having 12 pass deflections. 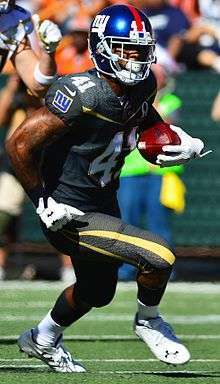 He played the 2014 season with jersey number 21, but in the 2015 season he changed to jersey number 41, giving 21 to Landon Collins. In a Giants Week 7 27-20 win against the Cowboys, Rodgers-Cromartie had two interceptions returning one of them for a touchdown. In Rodgers-Cromartie's second season with the Giants he had a career high 58 tackles. Rodgers-Cromartie also had two forced fumbles, three interceptions and 13 pass deflections while being named to his second Pro Bowl. In a Giants week 7 17-10 win against the Rams, Rodgers-Cromartie had two interceptions against Rams quarterback Case Keenum, one being in the endzone in the final seconds of the game to an ensure a Giants victory. He is the cousin of Indianapolis Colts cornerback Antonio Cromartie, San Francisco 49ers cornerback Marcus Cromartie, and free agent safety Da'Mon Cromartie-Smith. ↑ "Chart: Haitian Americans in the NFL". Retrieved 10 March 2014. ↑ "NFL urges contributions to Haitian earthquake relief". NFL. January 14, 2010. Retrieved October 7, 2012. ↑ Farmer, Sam (March 30, 2008). "Rodgers-Cromartie a top NFL draft prospect despite having one kidney". Los Angeles Times. ↑ "Dominique Rodgers - Stats". Retrieved 8 September 2016. ↑ Brooks, Bucky (February 27, 2008). "A pair of cornerbacks standing tall for small schools". Sports Illustrated. ↑ Pauline, Tony (January 23, 2008). "Senior Bowl Risers And Sliders". Sports Illustrated. ↑ "Pro Football War Room: Dominique Rodgers-Cromartie Profile". SportingNews.com. Retrieved 2009-05-28. ↑ "NFL Events: Combine Player Profiles - Dominique Rodgers-Cromartie". Retrieved 8 September 2016. ↑ "Dominique Rodgers-Cromatie Draft Profile", NFLDraftScout.com, retrieved March 3, 2010 . ↑ "Eagles' Rodgers-Cromartie fined $21K for Leftwich hit". Retrieved 8 September 2016. ↑ Rodgers-Cromartie to Broncos ESPN. Retrieved 14 March 2013. ↑ "Dominique Rodgers-Cromartie". ESPN.com. Retrieved 2016-02-01. ↑ Patra, Kevin (March 17, 2014). "Dominique Rodgers-Cromartie, Giants sign 5-year deal". NFL.com. Retrieved March 17, 2014. ↑ "Dominique Rodgers-Cromartie Stats". ESPN Internet Ventures. Retrieved 25 March 2014. ↑ "Eagles player profile". Eagleswebsite. Wikimedia Commons has media related to Dominique Rodgers-Cromartie.